Thanks for helping us reach three million views! To celebrate, the LINE Clova smart speaker and LINE Clova Lab team up with Nogizaka46 to smarten up your chats! Friend LINE Clova’s official account to get the set for free. 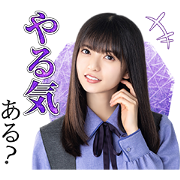 The television drama Zambi starring Asuka Saito from Nogizaka46 is here on LINE with a set of voiced stickers! Use them in your chats and you just might become a zambi yourself. Be sure to share them with all of your zambi friends!